This picture is kind of creepy looking...maybe it's the eerie bright glow. When chickens rule the world! 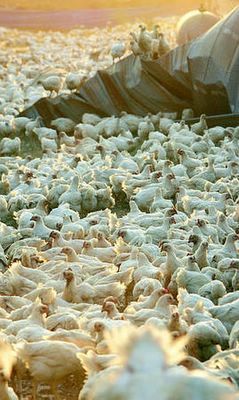 I guess all these poor suckers called "Broilers" are due to be destroyed as they are starving down on some farm hurt by Hurricane Katrina. Thank you thank you thank you for the card!! This has been a really horrible week (you can check out my other blog for details) and it was great to come home to some lovely mail. I hope your Trader Joe's trip was successful and you found some yummy things to eat. I recently discovered that their chocolate covered espresso beans are rather addictive. I must get back to work. Thanks again!